Yes I wear pants and other advice for working from home. I’ve worked from home part-time or full-time for the past four years. The first question I’m always asked when people learn I work from home is “Do you wear pants?” The answer is yes, I wear pants to work even when no one can see me. And frankly I don’t quite understand the desire of large numbers of people to work without pants, but it led me to realize that it might be helpful to share a few tips for people starting to work remotely. Okay, it doesn’t have to be pants, but get up and get dressed in clothes you don’t mind being seen in. The clothes we pick communicate, not only to other people but also to ourselves. Pick clothes to help you take your work seriously. Have a routine about when you start, and what you do to prepare yourself before you start for the day. Your commute might be a walk down the hall instead of a drive across town or a ride on public transit, but most people I know still benefit from a pre-work routine. Walk the dog, go for a run, eat breakfast, or some other basic activity. It doesn’t matter a whole lot what it is, but have a routine that gives you a few minutes to get settled into a frame of mind to be focused on what you are going to do at work. You never want to have to say “I can’t do that from here.” or “I’ll do that next time I’m in the office.” This is particularly true when you have a part-time remote arrangement (i.e. if you work from home 1 or 2 days a week), and the systems may not be setup to fully support remote workers. Push hard to get the technology fixed so you can do everything from home at least as well as you can in the office. Make sure you are set up with ways to informally communicate with colleagues. Whether that’s Slack, HipChat, Google hangouts, or some other tool, make sure there is a way to discuss totally unimportant stuff to maintain your personal relationships with your colleagues. When times gets stressful it’s critical to have good will built up and important to have a way to work out issues in private. It doesn’t have to be a nice office, but have a space you go to for work. Make sure it’s setup well for your work, and make sure you don’t spend lots of non-work time in that space. Don’t use the room with your TV or other simple distractions. Ideally you want a space with a door you can close so you can block out any other people who are around and focus. Like a morning to routine you need to have boundaries about when you are not working. We all have times we have to work late or step into an emergency, but that shouldn’t be happening most days. Finish your day at a predictable time most days. Make sure your colleagues know when you are available outside normal hours and limit how much you let them cheat. Most importantly sometimes be truly unavailable. Get out of your house/apartment at least once a day. When I first worked from home I realized that I’d gone a week without leaving my apartment complex and I was starting to go stir crazy which was bad for me and made less effective at work. Even if it’s just a trip to the store or a walk in the woods, get out and remember there is more to the world than your work. Lots of work places treat work from home as a privilege they may want to take away again. Even if that doesn’t seem possible in your company, make sure you are proving you are able to be productive with the freedom working from home gives you. Ideally you have a work space free from the normal distractions of a conventional office, so use that environment to get more done than you can in the office. If you work remotely full-time you need to make sure you still spend face-to-face time with your colleagues. Humans are geared to appreciate time spent together, and for all the technology allows us new freedoms about where and when we work, there is still a different quality when everyone is in one place together. Some companies do this at conferences, some hold retreats, some just call the remote staff to the main office a few times a year. Figure out what makes sense for you and your company and push to make sure it happens. Do things that help give your colleagues insight into who you are outside work. 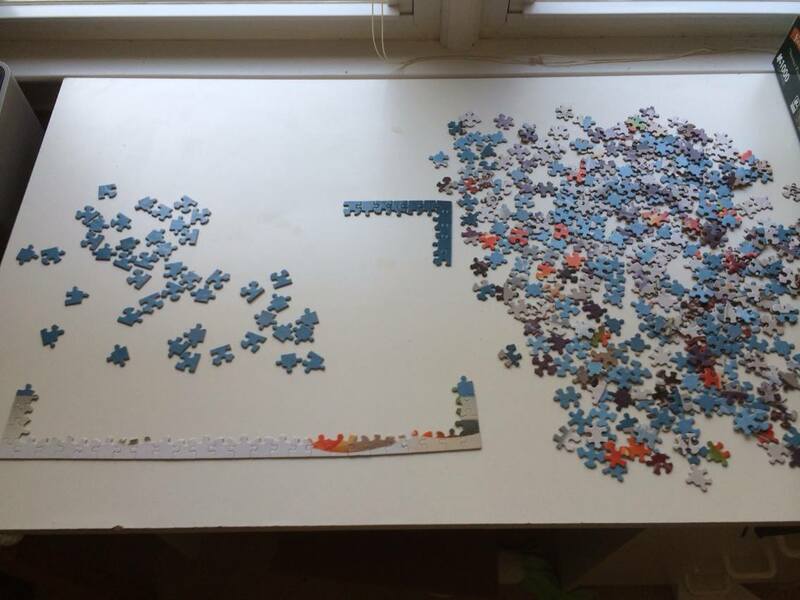 I keep a puzzle table in my office to help me clear my head and avoid boredom during long conference calls. 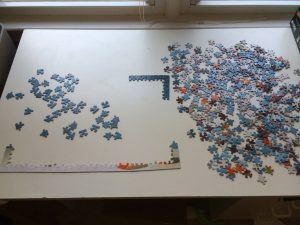 At a previous job we did a daily stand up video conference, and some days I would point the camera at the puzzle and worked on it as we talked. It served as a friendly way to help people see me as a real person not just a source of code. I also share pictures of my dogs and other things that round out people’s understanding of my life. Not all of these things are totally within your control, and you will need support from your company to make sure the environment is right for you to be successful. Work with your manager, other remote employees, and other colleagues to make sure the environment is going to allow you to be successful over time. Author Aaron CrosmanPosted on November 27, 2016 December 20, 2017 Categories Mistakes, WorkLeave a comment on Yes I wear pants and other advice for working from home.